I know I'm tired when I don't even feel like cooking. Usually, being in the kitchen is a sort of reprieve from the duties of 'real life' - but lately, I've been exhausted. Have you ever been there?! Anyway - I've been looking for EASY, delicious recipes that are fast to prepare. Last week, I happened to have some cooked chicken in my refrigerator, and I got creative. 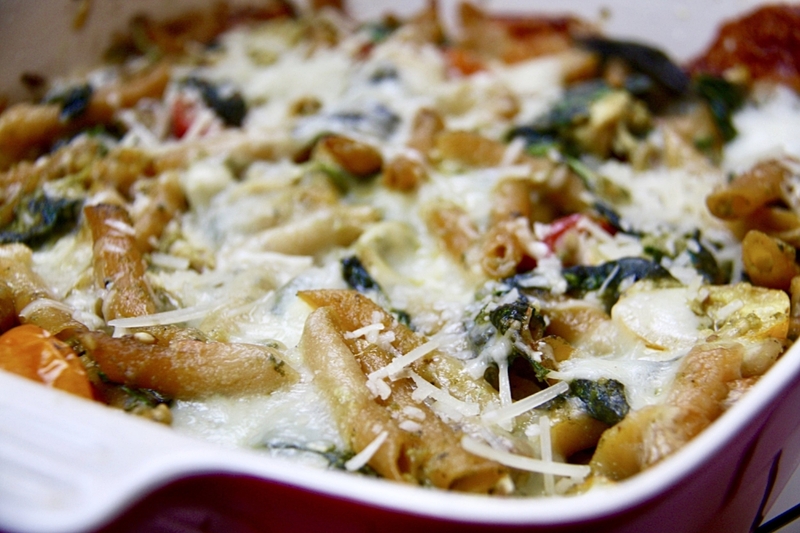 This Chicken Pesto Pasta Bake was born and let me tell you: it's AMAZING!! So good that my husband had three servings and asked me to make it again the next night! I used the Ancient Harvest Pow Green Lentil Pasta noodles for added protein (like 14 grams per 2 oz!!). Bonus? These noodles are gluten-free. If you don't have this brand laying around, you can find them at Whole Foods or any other specialty store. Or, you can use your preferred type of box pasta. Preheat oven to 400-degrees F. Spray a 9x11 casserole dish with nonstick spray. Boil Pow Green Lentil Pasta noodles until al dente. Drain, then set aside. While noodles are boiling, chop cooked chicken into small cubed pieces, or shred full chicken, removing skin and bones. Wash and chop heirloom tomatoes. If making pesto from scratch, in a blender or food processor, combine ingredients for pesto. In a large mixing bowl, combine chicken, tomatoes, and spinach. Add in mozzarella cheese and parmesan cheese. Mix thoroughly. Add in garlic powder, salt, and pepper. Finally, add in pesto and mix thoroughly. Spread pasta mixtureinto a casserole dish and top with additional cheese if desired. Bake for 20 minutes and enjoy!